All Studios are located between Floors 1 to 3 only, in Catalina 1 Tower. Older style units and décor. Studio’s present with a small kitchenette (No cooking facilities) Mini bar fridge only. Combined bathroom/laundry facilities, with Shower/Toilet only. Studios are Air Conditioned and offer Garden/Street Views only. Studios are similar in size, layout and appearance to that of a standard motel room. Minimum 2 night stay. All Studios are located between Floors 1 to 3 only, in Catalina 1 Tower. Older style units and decor. Studio’s present with a small kitchenette (No cooking facilities) Mini bar fridge only. Combined bathroom/laundry facilities, with Shower/Toilet only. Studios are Air Conditioned and offer Garden/Street Views only. Studios are similar in size, layout and appearance to that of a standard motel room. Minimum 3 night stay. All Studios are located between Floors 1 to 3 only, in Catalina 1 Tower. Older style units and decor. Studio’s present with a small kitchenette (No cooking facilities) Mini bar fridge only. Combined bathroom/laundry facilities, with Shower/Toilet only. Studios are Air Conditioned and offer Garden/Street Views only. Studios are similar in size, layout and appearance to that of a standard motel room. Minimum 5 night stay. All Studios are located between Floors 1 to 3 only, in Catalina 1 Tower. Older style units and décor. Studio’s present with a small kitchenette (No cooking facilities) Mini bar fridge only. Combined bathroom/laundry facilities, with Shower/Toilet only. Studios are Air Conditioned and offer Garden/Street Views only. Studios are similar in size, layout and appearance to that of a standard motel room. Minimum 7 night stay. Internationally acclaimed Catalina Resort sets the standard for luxury holiday accommodation on the Sunshine Coast! All of our Maroochydore apartments are stylishly decorated, fully self-contained, and inviting, providing you with the utmost in comfort. There are studio apartments as well as one, two, and three bedroom units, ­­­all with turnkey accommodation and everything you need to enjoy your stay. Except for the studio apartments, all units have spa baths. Each apartment has a well-equipped kitchenette or kitchen with a dishwasher and a stove. All apartments include laundry facilities and a seating area with flat-screen satellite TV and a DVD player. 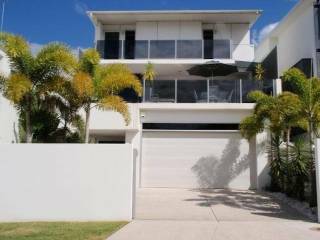 Featuring a tennis court, 2 heated swimming pools and a sauna, Catalina Resort is just 3 minutes’ walk from Maroochydore Beach. 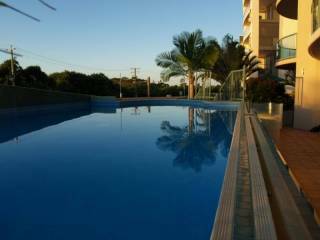 It offers self-contained accommodation with a private balcony overlooking the pool, gardens or ocean. You can enjoy a game of table tennis, or have a meal in the covered barbecue area. The property also offers dry cleaning services and vending machines for your convenience. The Sunshine Coast is a favourite playground and holiday destination for anyone who loves pristine white sand beaches, a fantastic climate, exploring nature and wildlife, as well as sightseeing and taking in local attractions that will be enjoyed by the entire family. Lying between the Coral Sea and the Blackall Ranges, the Sunshine Coast features a laid back lifestyle, barefoot elegance, and breathtaking beauty guaranteed to make your holiday one that will be remembered for a lifetime. 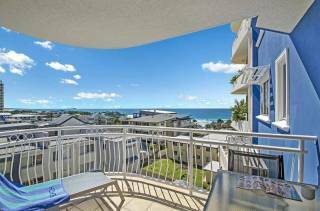 The two towers of Catalina Resorts Sunshine Coast are situated in colorful Maroochydore, right in the heart of the Sunshine Coast and on the banks of the Maroochy River. Located in the trendy Cotton Tree district, you will enjoy the boutiques, bistros, gourmet restaurants, and open air cafes that abound in this jewel of a tourist's mecca. Hiking, horseback riding, exploring, boating, fishing, sightseeing, swimming, surfing, shopping...or simply lying back on the spun sugar, private patrolled beach and letting the warm rays of the sun relax your cares away... Whatever you enjoy doing on your holidays is close at hand when you have accommodation at Catalina Sunshine Coast Resort. 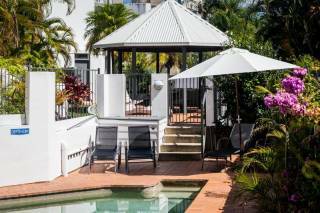 For luxury holiday accommodation Sunshine Coast at affordable prices, you need look no further! 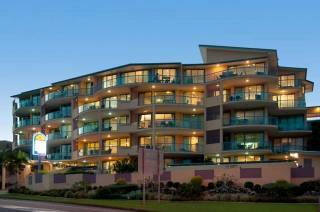 Catalina Resort in Maroochydore is your number one stop! Booking Confirmation & Payment Process: Once we receive your booking request and details, we will respond to you via email with a reconfirmation of your booking and relevant details; including selected apartment category, dates and associated costs. When received, we ask that you please take the time to check your booking details to ensure that they are correct, if you find that the details are incorrect please contact the resort immediately for assistance. Please ensure that you include your mobile phone number within your booking details along with your email address. Upon receipt of your booking request; a $200.00 Non Refundable deposit will be processed against your nominated credit card. This deposit will both secure and guarantee your booking with Catalina Resort. Your confirmation will also advise you of the remaining outstanding balance of your accommodation costs which will be payable in full upon arrival and check-in at the Resort. Please note that Guest check-in is available after 2.00pm and check-out time is strictly 10.00am on your scheduled day of departure. Our reception hours are: Monday to Friday: 8.30am until 5.00pm Saturday: 9.00am until 3.00pm Sunday / Public Holidays: 9.00am until 12.00noon If your scheduled time of arrival may be outside of our Reception hours, please telephone the resort 24 hours prior to your scheduled arrival as you will need to be advised of our 'After Hours' Guest check-in procedure and obtain the night safe combination, which will provide access to your unit keys. Full payment of your accommodation is required prior to unit keys being released. Therefore if you are arriving after hours please ensure that your account has been settled prior to your arrival to ensure release/collection of keys. Please be advised that payment of your accommodation cost may be made via: Visa or MasterCard, we do not accept payments via cheque. Upon arrival a credit card will be required as a security bond on the apartment. If a valid credit card is not available or provided, you will be required to provide a cash bond of $200.00 payable on check-in and refundable at time of your departure and inspection of the apartment. The number of guests in your apartment will be recorded on check-in and we ask for your co-operation in not breaching our Health & Safety regulations by exceeding the number of registered guests for your chosen accommodation. All guests must be over the age of 21 years unless accompanied by a parent or guardian. Proof of age in the form of photo ID may be required prior to release of keys. *Please be advised that all accommodation deposits are 'Non-Refundable' and that Catalina Resort has a strict NO PARTY POLICY and this policy will be enforced at all times.